Wear what you love and stand out from the crowd with a perfect fit tailored red shirt. Whatever the occasion a made-to-measure red shirt will turn heads and start conversations. Dressed in your red dress shirt, you’ll work any room with passion, confidence and charisma. Let your creativity flow and discover your perfect fit red dress shirt today. Choose from countless different shirt styles and shades of red. Customise any detail and make your tailored red shirt truly unique. Take your shirt to another level with pattern print cuff and collar contrasts. Whatever your choice, we have the perfect red shirt for you. 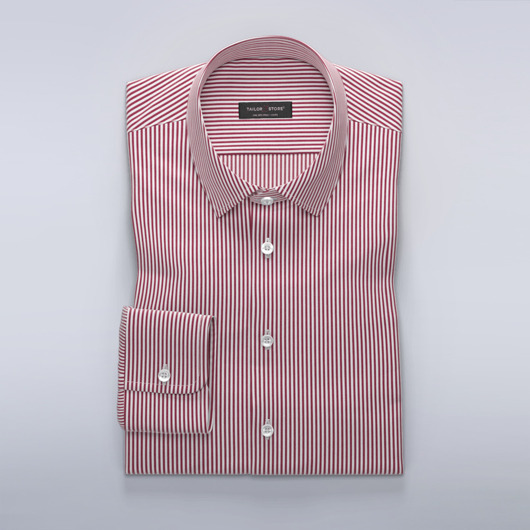 Make an impression with a crisp, modern, and stylish red made to measure shirt. Experiment with light and dark shades. Claret or Maroon reds look spectacular in 100% long-fibre satin when paired with chinos or a dark tailored suit. Going to the theatre, a concert or the ballet? A dark red tailored shirt with matching buttons whispers sophisticated elegance whatever the occasion. Browse our wide selection of luxurious red fabrics hand-chosen from Paris and Milan fabric fairs. Order your made to measure red shirt today, then button-up, sit back, and enjoy the compliments.